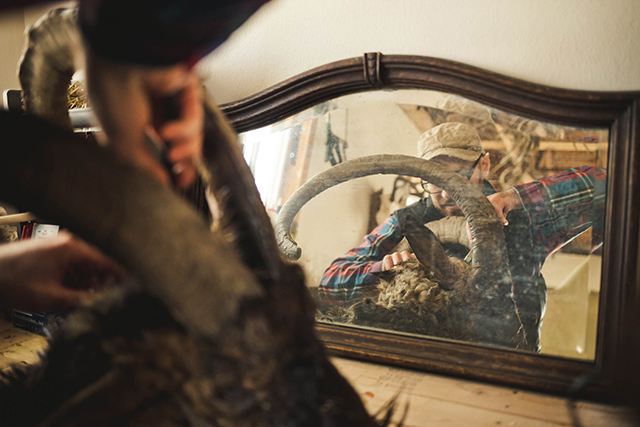 A visual narrative profiling Austin, Texas based Wildlife Designs Taxidermy. Words by Kristen Munson. 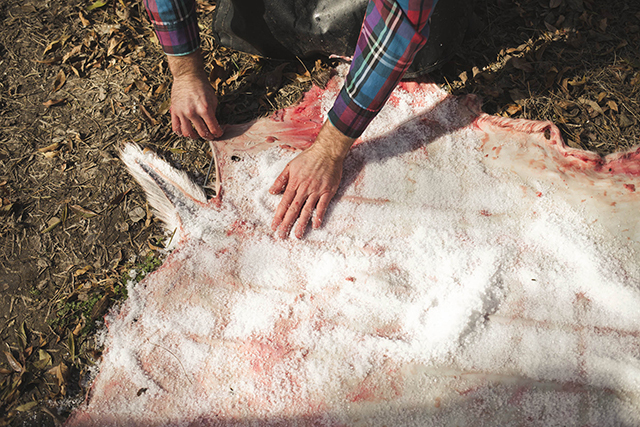 Tanning a hide, stretching it across a manikin, and mounting it to a wall is more about preserving a story than an animal skin. It is about connecting us to a moment we can never have back, but often wish we could. Taxidermy is art that requires a death. It is designed to resurrect life. 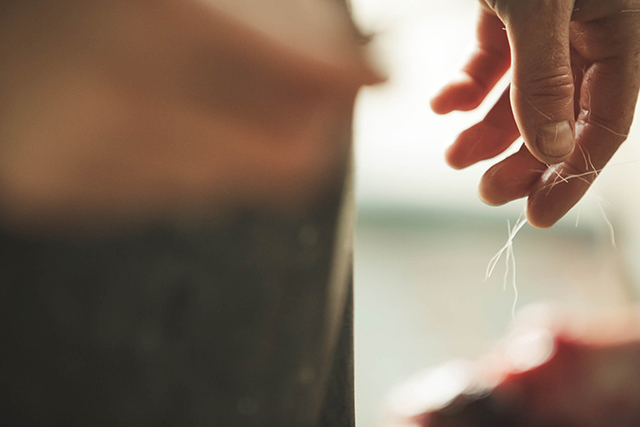 Each project begins by stripping an animal skin of its meat and internal organs before curing the epidermis to draw out moisture and blood. The first animal David Williamson fleshed was a lion. He was 11. At the time he thought it was cool. Then things changed. Williamson is not what you might expect when meeting a taxidermist for the first time. He is not a recluse. He is not Norman Bates. Williamson is an affable father of two with a close shaved beard and the thick, black-rimmed glasses of an architect. Or in his case, a certified public accountant. As you walk up the driveway of his ranch home in Austin, Texas, the head of a nilgai – an antelope native to the grasslands of India – stares you down. Williamson is sweeping out the garage. He hands you a mug of coffee and leads you to the backyard carrying two fresh deerskins. Sun streams onto a patch of grass covered with a wooden board. He examines a pelt draped across a plank. Underneath it blood-soaked salt dries brown in the sun. Williamson unfurls the two skins across the wood and reaches for a bag of salt. “We are dealing with things that will rot or decay,” he says. Williamson is a third generation taxidermist. He learned the science of the profession as a child in his father Robert’s shop, a building the two raised together on a two-acre parcel of land in the panhandle of Texas. Williamson, 28, spent a decade learning how to tan leather, build manikins, and mount animals from grizzly bears and bobcats to elk and zebras. But it wasn’t something he liked to talk about. Williamson’s parents divorced when he was a baby. Growing up he spent weekends working in the taxidermy shop with his dad. By age 10, Williamson was his father’s right hand man after he broke his back in a motorcycle accident. During reconstructive surgery his father flatlined on the table. “He died. For a few minutes he died, but he was brought back to life,” Williamson says before heading back into the garage. As he grew older, Williamson’s father wanted him to be his protégé. And Williamson didn’t. One afternoon after an argument Williamson’s father fired him. He was 19. Williamson moved from Amarillo to Austin where he apprenticed for a local taxidermist to pay the bills while he studied accounting. He learned new techniques that produced better quality mounts and twice as efficient. After graduating Williamson scored a desk job. He worked long hours. He became confused. Around the same time his father’s health began to fail. Williamson helped him close the shop and sell his home. Before leaving the property Williamson claimed some of the tools. Afterward he read the book Shop Class as Soulcraft: An Inquiry into the Value of Work by Matthew B. Crawford. He began telling people he was a CPA and a taxidermist. He found that no one ever asked about accounting. Taxidermy makes some people uncomfortable. Animal skins are commonly worn in the form of shoes or draped around waists and stored in back pockets in the name of fashion. But the moment a skin is mounted to a wall, taxidermy becomes something macabre. For many people, death is something to put in the ground or burn to ashes, not put on display in the family room. However, taxidermy is a story people want to tell. “They always want to tell the story,” Williamson says. A former customer of his father’s recently told Williamson one he had never heard before. Years ago the man witnessed Williamson’s dad arguing with a customer about a duck mount. The customer insisted he had requested the duck be posed in a standing position, not flying. Williamson’s father insisted he hadn’t. Williamson splays a freshly tanned deerskin atop his workbench. With a paring knife he shaves off portions around the nose. He scores the ears to prevent them from warping as they dry. Williamson threads a needle with fishing wire and sews tiny holes in the skin. Williamson’s father was a nurse as well as a taxidermist. He was a Vietnam War veteran and occasionally took in homeless men and women. He gave shelter to the outcasts in society. He was always poor. And he spent decades fighting with his inner demons. He died in 2010. Williamson mixes a salve of epoxy and fiberglass and scoops it into the empty ear pockets of the deerskin. He molds them into an alert position and waits for them to dry before stretching the hide over the manikin. Afterward he inserts glass eyeballs into the sockets and gently smoothes strips of clay around them with his thumb. 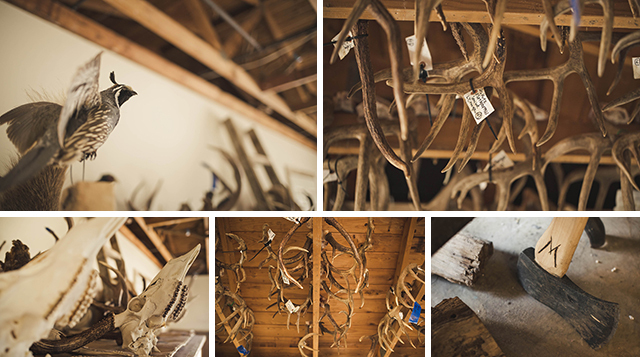 Dozens of antlers once belonging to foraging deer, elk, and reindeer hang from the rafters above. Three newspaper stories from the Amarillo Globe News are framed on the wall and span nearly 40 years between publishing. One is a profile of his grandfather and the other two features are about his father. “Taxidermy is kind of a lonely profession, but you find in any business that people stay in it because they love the work,” Williamson’s dad says in one story. Williamson listens to the quote while tucking the skin around the deer’s eyes into grooves carved into the manikin with a mottling tool. Taxidermy is handling the remains of the dead. This can force one to think about how you live your life. On the windowsill between a canister of WD-40 and a jar of paintbrushes, a plastic Folger’s coffee can rests at eye level. It doesn’t contain coffee grinds. Nowadays Williamson works alone. If he listens closely he might hear his infant daughter crying inside the house or his 3-year-old son Wyatt laughing from the other side of the garage door. From the workshop Williamson can hear birds chirping and cars driving down the street. His mind wanders. Williamson recently quit his full-time job at an accounting firm and launched his business Wildlife Designs Taxidermy. Before giving his notice he asked his boss if he could work 40 hours a week for the next 15 years and delay pursuing the path to partner. His boss said it doesn’t work that way. An hour later two men arrive to collect their trophies. A common hunting tradition is to have the first big game you kill mounted. 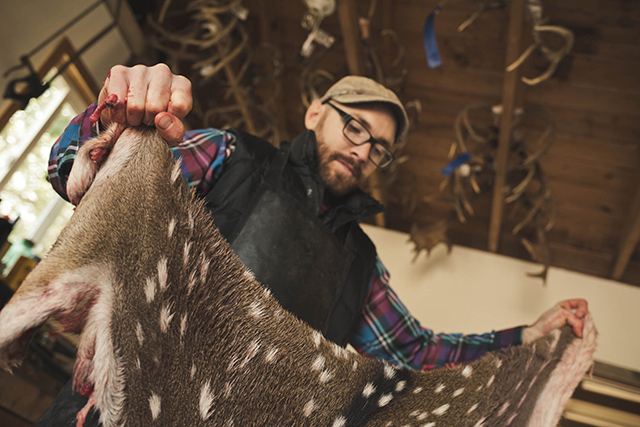 The older man, wearing blue jeans and a cotton dress shirt, points out the various deformities in the antlers of his deer. “They’re all unique,” he says tracing a point with his forefinger. The younger man nods but never says a word. He looks as though he came from band practice. The father shakes Williamson’s hand and leads his son down the walk. The two men climb into the cab of a pickup truck. Sometimes all a father and son have in common is the time they spend together. He lifts a green wing teal from a shelf below the framed newspaper clippings. Williamson’s dad mounted it for him years earlier.